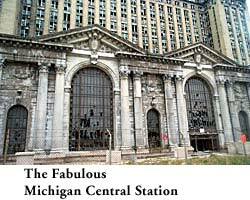 "The Fabulous Ruins of Detroit began as sparkling edifices, the fulfillment of the dreams of their architects and developers. Their end did not come suddenly, as part of some natural disaster or war. Instead it resulted from an accumulated lack of basic aesthetic sensibility. A small thing left broken here, an indiscretion of taste there, until a preponderance of damage equals an insoluble situation. What was revered becomes scorned. Abandonment and vandalism follow and the damage becomes irreparable." Rome has ruins, Athens has ruins. But Detroits are taller  and more extensive. And Detroit artist Lowell Boileau wants to be your tour guide. What began as a tongue-in-cheek website you might find for Rome has tapped into the pulse of a city that struggles to rise from its ashes. "I had painted the ruins of Detroit for years, and knew there was sentiment for them," says Lowell. "But I never realized the extent or amount of emotion toward them and Detroit that existed. A trickle of email response soon became a flood with people pouring out their hearts and memories. Some even said they were in tears, the ultimate compliment to an artist. "I then realized that this was not just a guide to the ruins of Detroit, pictures and text, but an interactive community of emotions and exchange of ideas. So I evolved the site to accommodate this by creating a discussion forum, to move the site beyond me to derive an audience created art work. I also set up events to put human faces on to the participants such as the Fabulous Ruins night at the Cass Cafe in Detroit last February." Surprisingly, Lowell shies away from the moniker of a preservationist. "What really attracts me to these buildings is their visual presence and immensity. They are simply awesome in their deliquentness, and the artist inside me stands in awe." The site has received an enormous amount of media coverage and traffic, averaging about one million visitor sessions a year, generating close to ten million page hits. All without costly promotions or publicity. "I have made no attempt to spread the word about this site. It has all happened on its own. In October of 1998, Yahoo anointed it, unknown to me, as a Yahoo pick of the week." Traffic to the site got so heavy that it cost Lowell an extra $440 in charges, nearly forcing the site to shut down. "I appealed for help on the site and a rising web firm, Sigma6, came to the rescue and hosted me, so it continued," says Lowell. "It later was made a Yahoo pick of the year. From there it spread by word of email. Folks liked it, I guess, and told all their friends about it. News sources picked it up including the New York Times, and Wired Magazine, and numerous other media sources covered it, driving its recognition even wider." No wonder. A visit to the Fabulous Ruins of Detroit brings into focus architectural wonders that are both magnificent and disturbing in their current state. Detroits Guilded Age, which began in the 1880s and ushered in the automotive era, was marked by the design and construction of many fine structures that have been etched into our psyche on this side of the river. It was also an era marked by egomania and greed, which has since led to abandonment and ruins. The site is massive, and is divided into thirteen main sections, guiding the visitor through both express excursions and detours. Expect to spend an hour simply taking the express tour, or take the detours and get lost in this site for hours. The Industrial Ruins tour highlights Lowells photography and artwork, featuring the demolition of the "Seven Sisters" smokestacks, or more officially, the Detroit Edison Conners Creek Power Station, a Windsor landmark and beacon for generations of sailors demolished in 1996. He pinpoints Henry Fords Piquette Plant where Ford developed his first cars in 1904 and Fords Highland Park Model T Plant, "the factory that changed the world." 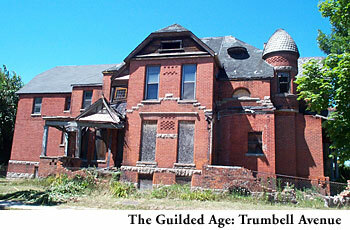 In The Guilded Age section, tour the Brush Park area, located just north of the new Comerica Park. Many of these splendid structures remain in a neighbourhood once called "little Paris" at the turn of the century. Boileaus photos of urban decay are riveting. Since the construction of Comerica, Brush Park has experienced a rebirth of sorts, and it is now well worth touring by car, using Lowells site as a tour map. For Windsorites, the Downtown Ruins section will scare up some ghosts of the past. The Hudsons demolition, Tiger Stadium, The Book Cadillac, Joe Muers, the Monroe Block and some lesser known discoveries, such as the tragic Michigan Theatre and the Madison Lenox across the street from Comerica Park. And yet, not all is doom and gloom at The Fabulous Ruins website. In The City Rises, Lowell notes: "In spite of what has preceeded I am pleased to report that Detroit is energetically rebounding. Beyond the highly profiled new developments, there has been an encouraging and increasing number of historic preservations." Profiles include the Parke-Davis complex across from Walkerville, The Gem Theatre, and the David Whitney Mansion, among others. 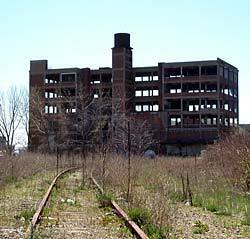 I have used this site as a guide for touring the fabulous ruins of Detroit in person. The maps on the site are excellent, and can help the avid ruins tourist locate and explore splendid buildings and neighbourhoods that once rivalled any found on the continent.